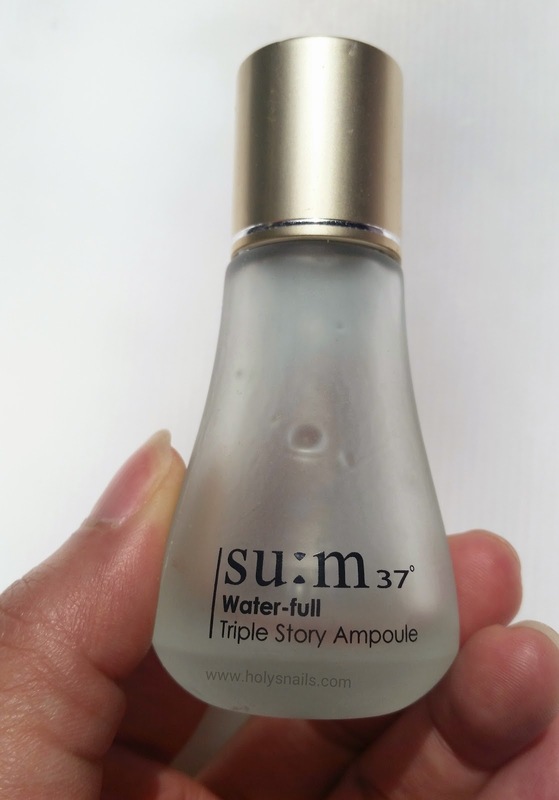 su:m37 Water-Full Triple Story Ampoule Review + Ingredients Translation | Holy Snails! 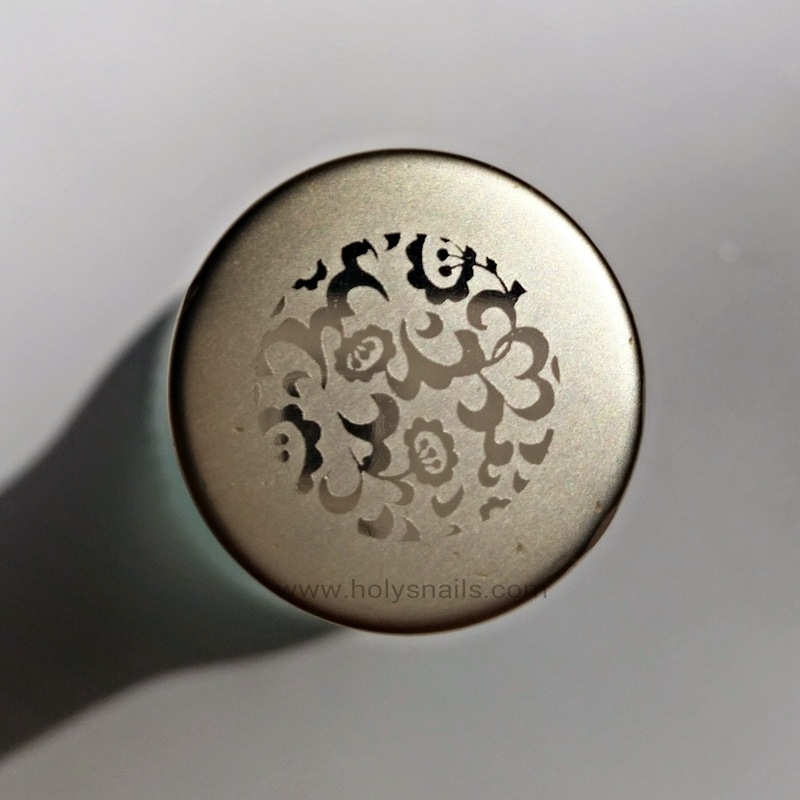 When I first started getting into AB, this was one of those mysterious products that looked so enticing, but I couldn't find any information on. Couple that with the $100 price tag, no samples, and you've got a product that just lives in my In Case I Hit The Lottery Wishlist. Luckily, it was included in my Water-Full Set, so I can at least check this off my skincare bucket list (that's a Thing, right?). The three-story shape of this fermented moisture serum in ampoule, with its immediate refreshing touch with your skin, provides deep moisture, removes dead skin cells, and smoothes out skin surface. 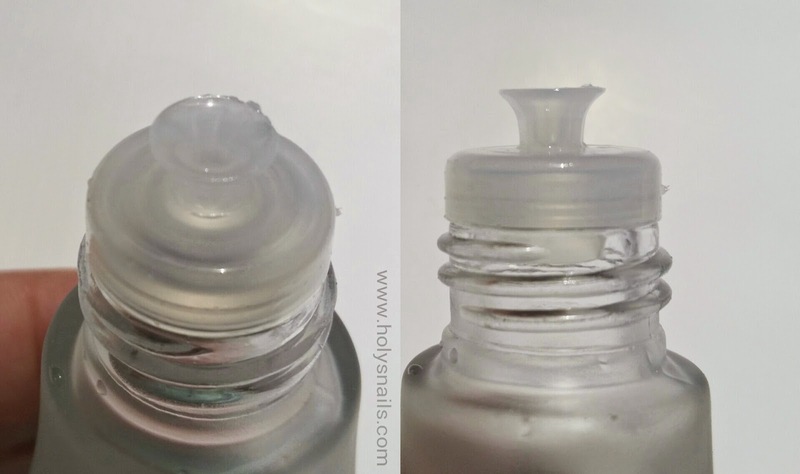 After using skin refresher but before essence, shake a bottle 5-6 times to mix the formula enough to become even color. 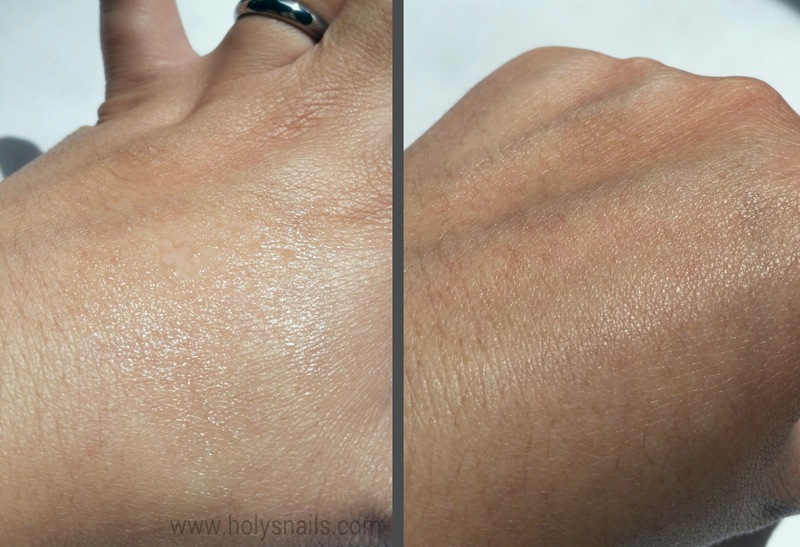 Take small amount on the palms or dispense it on the face directly, and apply evenly over face. 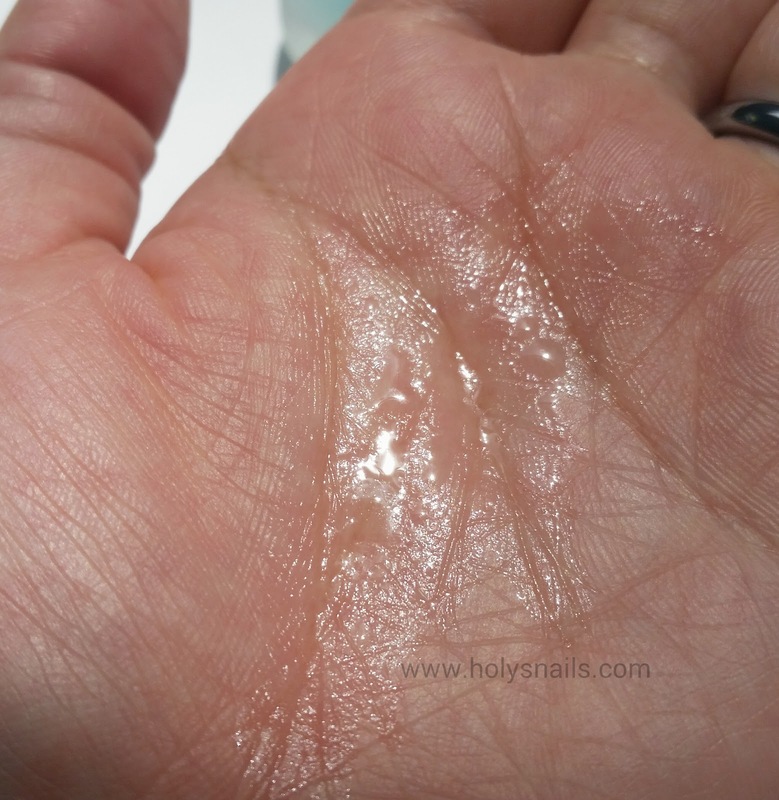 Gently pat until skin absorb enough moisture. 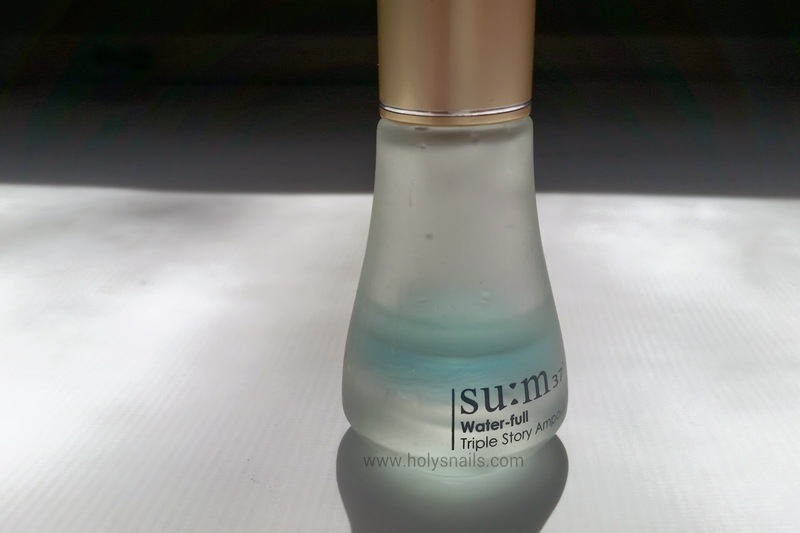 For more information on the su:m37 brand, check out my review of the Water-Full Skin Refresher. So according to the description, its claims are to hydrate, moisturize, and...exfoliate? "Removes dead skin cells" and "smoothes out skin surface" are what AHAs do. What is in this thing? Three 15 ml bottles will run you anywhere from $90 to $130, which makes this a really pricey buy indeed. At its cheapest, that's $2/ml, compared to other popular ampoules like Missha's Long Name Ampoule (assuming full regular price) at $1/ml, or Mizon's Snail Repair Intensive Ampoule at $0.37/ml. 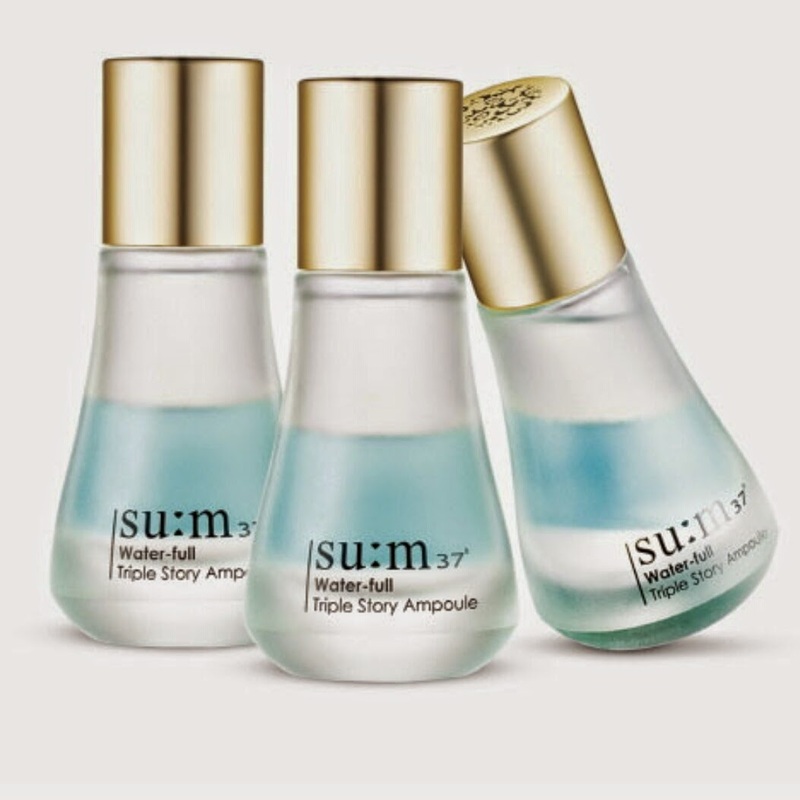 Although compared to their own ampoules, like the Secret Repair Concentrate (arguably their most popular one) at $2.16/ml, or other high end brands like Sulwhasoo's Essential Revitalizing Serum at $1.86/ml, it's priced pretty fairly. Potential acne triggers are listed in red. Numbers indicate its rating out of 5. Potential irritation triggers are listed in orange. Numbers indicate its rating out of 5. CosDNA link here. Don't take it as gospel though, because #1 YMMV, and #2, it gave up a third of the way down the list. Balhyo oil (fermented oil): Fermented Amazonian Pracaxi oil protect moisture in skin and balance water and oil. Balhyo water (fermented water): Fermented snow lotus water, fermented bamboo water, and fermented flowers (red clover, hibiscus, gold-silver flowers). Oxygen: Oxygen from fluorine oil, which has 33% of the oxygen, used in therapy for burn patients. If I were a betting snail lover, I'd say the top three ingredients are the main solvents for each layer. Perfluorohexane (1st) is one of a few fluorocarbons (PFCs) on the list, which are used to dissolve oxygen. This method can be used to treat burn victims, as it has some wound healing abilities. However, in a cosmetic application, it gets a little confusing. I found a study that states this method can improve barrier function (specifically, with perfluorodecalin, which is also in here), Another study makes a very good point that active oxidizable molecules in essential oils could be degraded when they come into contact with oxygen. If you look at the ingredients list, basically the bottom fifth of it is essential oils (which are already potentially phototoxic), which is worrisome to me, since you use this product by shaking everything up. Also, I was unable to find any studies listing definitively that oxygen is a good cosmetic product, and quite a few people seemed concerned that it could, you know, oxidize your skin and undo all the antioxidants' hard work. I'm going to guess all of the extracts are in the purified water layer, with denatured alcohol added to thin out the ingredients and to act as a penetration enhancer. 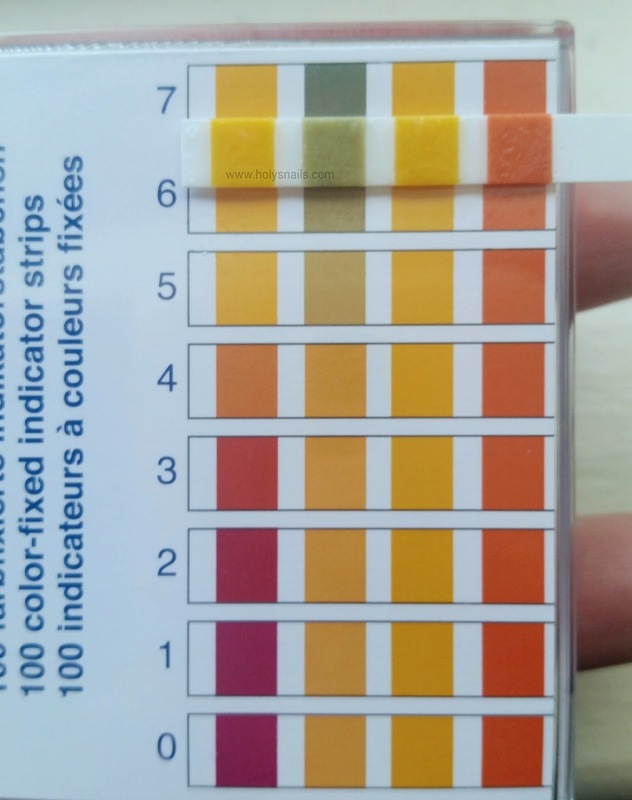 Among the many extracts listed, and some already mentioned, I think lemon peel ferment filtrate is notable, as it has brightening/lightening properties. Malachite extract is rich in copper and a good anti-oxidant. Fermented tomato, papaya, and pomegranate extracts are listed, and I'm wondering if that's their "exfoliant," since I don't see any obvious AHAs or BHAs, beyond citric acid, which I'm pretty sure is there as a pH adjuster. So possibly fruit acids, which are pretty common in Korean cosmetics, given their laws on using AHAs/BHAs. However, those are also in the toner and gel lotion, so I'm assuming they're just there as antioxidants. The last layer is probably silicones to suspend the oils. I'd point out the oils, but seriously....they're so low on the list... It's a neat trick, but I don't know how useful anything in that layer would be beyond some emollient/skin conditioning properties. See it running down the glass? This stuff separates pretty quickly too. 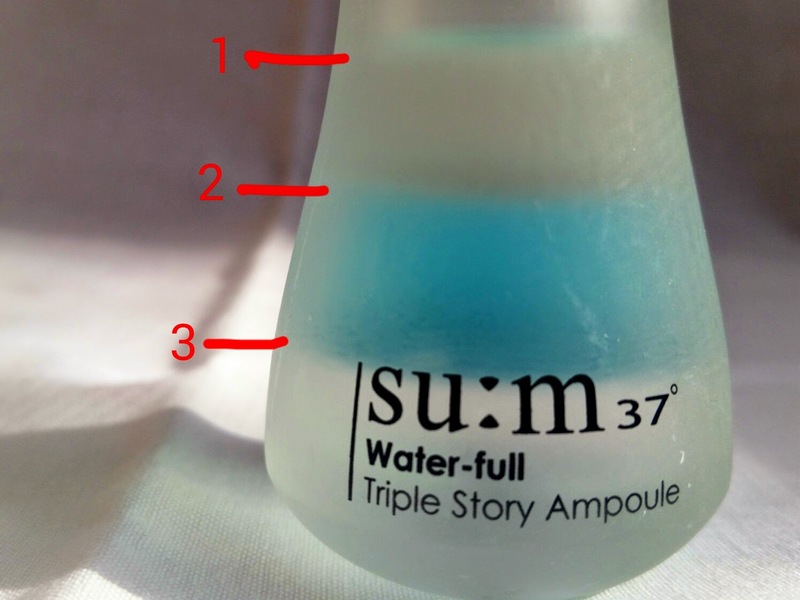 According to su:m37, this product is meant to be used after the toner, and before the essence, which is kind of the reverse of most other brand lines, where the essence is typically watery and goes before the thicker ampoule. The bottle is heavy glass with a satin finish. It has a twist off cap that has the signature su:m37 flower logo on top. Removing the cap reveals this odd little dispenser/reducer. I don't know if it works better than a regular dispenser, but I guess at ~$33 a bottle, they want something a little fancy looking. I tried to capture this as best as I could, but you can see where some of the liquid immediately sunk into my skin, and some kind of make little globules. That's after I shook the crap out of the bottle, and it happens every time. A bit hard to tell, because this stuff absorbs crazy fast, but the left is immediately upon application and the right is a couple of seconds later. It feels very slick, with plenty of slip for the second or two that it takes to absorb,. It's also very cooling, and leaves a matte finish. My skin feels softer after applying, but this effect does not last longer than a couple of minutes. It has a very interesting smell. Not offensive, and vaguely floral, but...chemical? The first couple of times I used this, I hadn't looked at the ingredients list yet, and was kind of concerned at wtf was I putting on my face because of the smell. There are notes of the essential oils, so it resembles other products in the Water-Full line, but it reminded me of my O-Chem lab days. Banana pack for scale. It's tiny! I'm sorry, y'all. I know I should be praising all!the!things! so there are more things for people to lust after, but this was such a letdown. It doesn't really do anything spectacular, or even well. 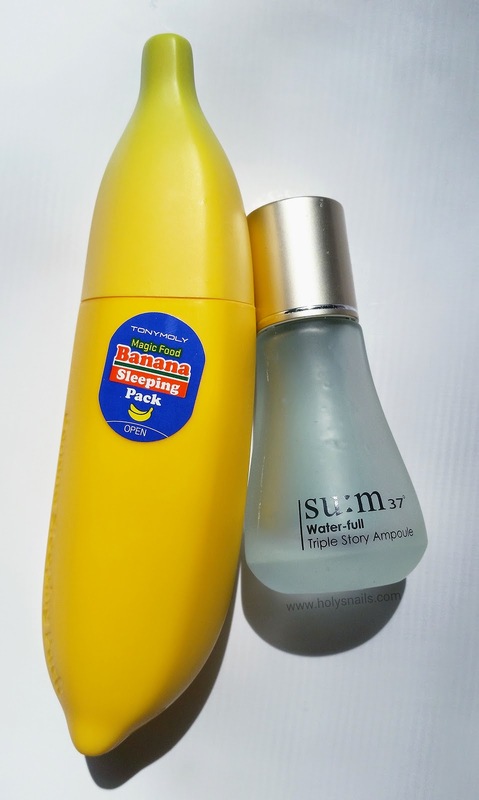 Some hydration, and some temporary skin softening...you can find those in plenty of other products. It's also kind of difficult to use, as it absorbs really fast. I guess you could shake it directly onto your face, as opposed to hands first, but I feel weird about that, and I have poor aim. The Good: Hydrating, very pretty packaging, temporarily softens skin and feels cooling. The Bad: Very expensive, questionable ingredients, doesn't do anything amazing.